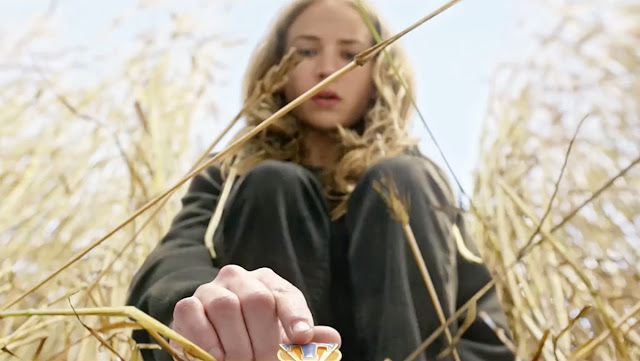 Tomorrowland is a film of big ideas and bigger ideals, an imaginatively gift-wrapped note to humanity to asking us to shape up, keep dreaming, and - if we please - to not allow ourselves to feel the oppressive weight of the cycle of destruction we've locked ourselves into. It's an ambitious project that bounces between timelines and worlds, and for a few moments it's really quite refreshing to watch a kid-oriented adventure film work to demand that its audience engages actively with its strange politics. The film is, after all, the product of Brad Bird (The Incredibles, Ratatouille) and Damon Lindelof (Lost), two dudes who can't seem to get away from the notion that their cinematic outings should - at least- attempt to impart something to the audience or work towards an expression of something outsized and complicated. If you're optimistic enough to follow them for a while, Tomorrowland has its merits. It puts in the work. It's an original idea. It wants to do something good. It gives us a strong, YA-style female protagonist. It establishes a world very quickly. For all that it manages to do well, though, the final product is somehow lackluster. 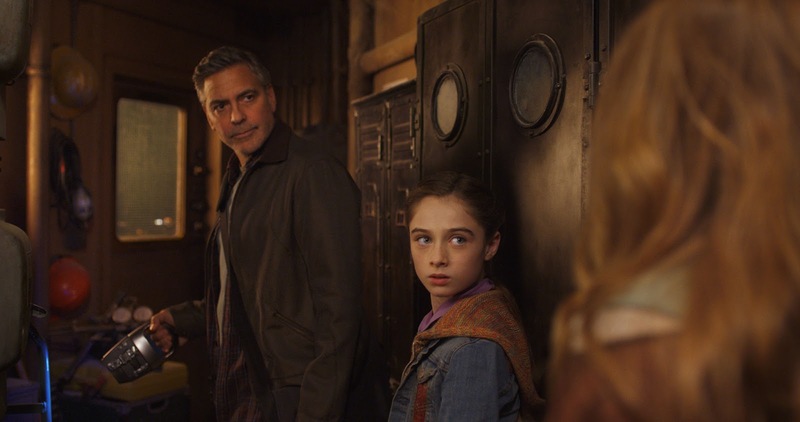 There's a forgettable quality to Tomorrowland, and it's one that stems - oddly - from the weight of its ideological baggage. It does a little too much, tries a little too hard, and in the process grows to a size that becomes cumbersome. There are roughly three distinct films smashed into the run time of this would-be blockbuster: there's the story of Casey Newton (Britt Robertson), an intellectually curious teenager who is given a mysterious object capable of showing her new worlds. Then there's the story of Frank Walker (George Clooney), a disgruntled inventor who was cast out of an experimental utopia decades earlier. Finally, there's the space where they come together: in a last ditch dimension-hopping bid to save humanity and prevent the seemingly inevitable. 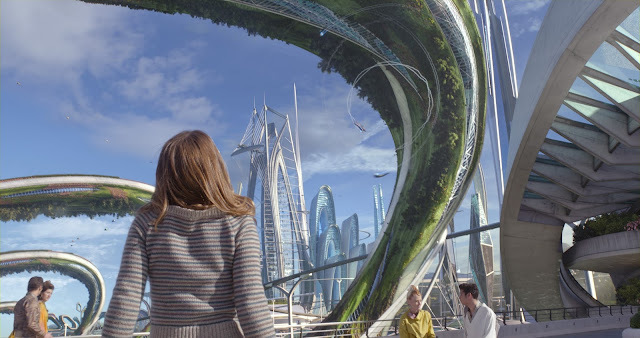 Smashed against one another, the film is burdened with a glut of crisscrossing origin stories and forced world-building: this is life for Casey, this was life for Frank, this is Frank at present, this is "Tomorrowland", and so on down the line. It's material perhaps better served by a written trilogy or an entire season of television. While I'm certainly not one to shy away from a film that stresses the importance of its narrative, in the case of Tomorrowland, we are given too much, too fast. The result is scattershot: we don't have time to become emotionally invested with the characters, to understand the motivations of the (predictable) villains, or to actually feel the awe that Tomorrowland's landscape could inspire. So, instead of dreamy idealism we're more likely to leave with a little bit of a headache and a light appreciation for what the film could have been. And really...it could have been great. In its best moments, Tomorrowland feels like an old school Disney movie: much more in line with the live action adventures they were producing in the 1960s and 70s. It seems to sincerely believe that it carries the potential to inspire a generation, and there are really lovely moments of ingenuity throughout. The breakout performance here, without a doubt, is Raffey Cassidy as Athena, an android-child who we learn has been tasked with seeking out the best and brightest minds of the human race. Cassidy plays her with surprising wit and charm, even as the filmmakers opt to misuse her character by embroiling her in a confusing (and supremely awkward) "relationship" with Frank. This is, of course, one of the major problem points preventing the film from succeeding: the bond is an ill-advised course of action, and one that leaves a sour taste at precisely the wrong moment as they can't seem to differentiate between the budding romantic feelings Frank experienced in childhood and the adult attachment dredged up by her reappearance. She's not human, but it's a little weird when an adult man has so many feelings for a child-shaped robot. This is one of those attachments I believe could have been more accurately placed and dealt with given a different format. Rewrite it as a comic book, Disney. Build it for a decade. Try again.